​This popular event was an early sell-out last year. Guests will delight in this Whiskey Wine & Wildlife wine cruise with Captain Phillip. Tour the enchanting waters that surround Jekyll Island and engage in this most unique wine tasting experience. The cruise will embark at 11:00 am from the public wharf located opposite the Jekyll Island Club Hotel. 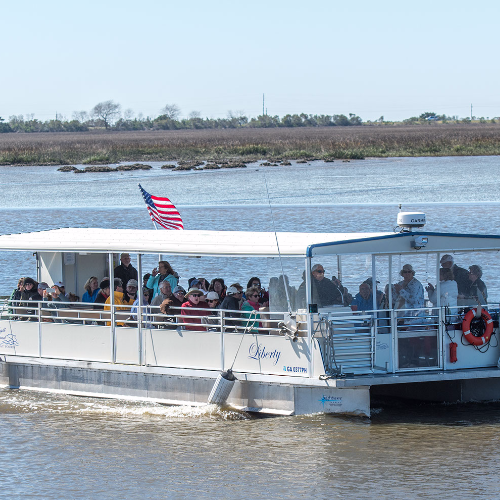 Along with the wine tastings, guests will be able to indulge in some light food preparations as they experience a different perspective of beautiful Jekyll Island, coupled with the insights and "local" knowledge that only Captain Phillip can render.